Stick to your knitting. That’s a famous line and the implication is that you should do what you know best to do. It acts also as a warning to be wary of going beyond your knitting. If you step outside your zone, it could be dicey. It could be troubling. It could be disastrous. There’s also another interpretation. If you have a knitting, you ought to know what it is, and thus you can stick with it. In other words, if you don’t even know what your knitting is, you likely have little chance or maybe a random chance of even sticking with it, since you didn’t even know that it existed. Why all this talk about knitting? Because there is a myriad of firms deeply involved in AI self-driving cars and the question arises as to which of them are sticking to their knitting and which of them are not. I’d dare say that we all would likely agree that any major auto maker has to be doing something substantial as it relates to AI self-driving cars. An auto maker is by definition a maker of automobiles. If you believe that the AI self-driving car will ultimately transform the landscape of cars as an industry and a marketplace, an auto maker would seem pretty foolish and blind to not be trying to anticipate and cope with that emergent radical change. Last year, the Ford CEO Mark Fields was ousted and some analysts say it was to a great extent due to his seemingly lukewarm attitude and actions toward AI self-driving cars. It didn’t seem to the marketplace that he was willing to move boldly into AI self-driving cars. Perception and reality are two important concepts. The perception by the marketplace is that auto makers must be doing something of substance about AI self-driving cars, even if the auto maker maybe has its doubts about AI self-driving cars. By doubts, I don’t necessarily mean that the auto maker believes it cannot be achieved, it might be instead that they see it as a longer term proposition. If you were the head of an auto maker, and if you believed that true AI self-driving cars are not likely for another decade or more, you might opt to spend the company’s resources towards other more pressing matters right now. Most firms live from quarter to quarter, and maybe can do some form of 3 to 5 year planning for what’s ahead. Confronted with limited resources and tough choices, you might be tempted to push off those things that seem like a remote chance of happening anytime soon, and use your efforts towards those in the nearer term that seem to matter. This might seem prudent, except for the fact that the marketplace might have a different view on the topic. If there is a mania toward something, and it’s in your line of business, and you seem to be ignoring it or discounting it, the odds are that the market will punish you. They will interpret your hesitations as an indicator of being stodgy, of being ignorant, of being ill-informed. It will be assumed that you are out to lunch. It will be assumed that you are going to let some disrupter step into your industry and transform it and wipe you out. Meanwhile, you stood around and just watched it happen. Bad on you. Some liken the upcoming shift toward AI self-driving cars from conventional cars as similar to the shift from horse and carriage to the advent of the automobile. Sure, it took years to happen. But, meanwhile, further investing in those carriages and those horses is going to be interpreted as mired in the past. Via hindsight, we now know that the automobile did indeed overtake the horse and carriage. You might argue that we don’t know for sure that AI self-driving cars will overtake the conventional car, and so it is just conjecture or speculation. That being said, the marketplace sure believes that AI self-driving cars are going to win out in this car evolution battle, and any auto maker that doesn’t seem to express the same is going to suffer the wrath of the market. Right or wrong. So, making cars is the presumed knitting of the auto makers. AI self-driving cars sure seem to be the next evolution of cars. As the famous line suggests, auto makers should stick to their knitting, meaning the making of cars, and presumably become makers of AI self-driving cars. But, a self-driving car is not just a car, it’s a car that is combined with AI. Some question whether the auto makers can really grasp the nature of AI and figure out how to deploy it into cars. Maybe some auto makers are not cut out to do AI self-driving cars. They are so shaped around and preoccupied by conventional cars that their ability to re-focus and re-shape to make AI self-driving cars is beyond their means. This is why we’ve seen tech firms step into the AI self-driving car realm. If you believe that the AI part of the self-driving car equation is the crucial element, you might suggest that the tech firms have a better grasp of the AI and so they are sticking to their knitting, namely, the development of AI. There is some amount of market pressure on tech firms to do something about AI self-driving cars, in the sense that if AI self-driving cars are going to happen and become widespread, any tech firm that wasn’t involved might be left outside the bonanza of tech aspects that will be integral to the AI self-driving car. Thus, we seem to have two knittings happening at the same time. There’s the knitting of making cars. There’s the knitting of making AI. Which of those is the more important part of the AI self-driving car puzzle. By far, the pressure is more so on the car makers about pushing toward AI self-driving cars. Google’s Waymo for example is not under the same kind of pressures as a pure auto maker. The marketplace perceives that Waymo is doing something cool and innovative, and that it might lead to something, but even if it doesn’t get us to AI self-driving cars there is still lots of spin-off aspects to having pursued AI self-driving cars. And, the allure of Google’s effort of AI self-driving cars attracts other hot high-tech talent to Google overall, merely because the AI self-driving cars reflects the kind of futuristic innovation that such high-tech talent cherishes overall, irrespective per se of the need for or success of the self-driving cars side of things. For the auto makers, the marketplace perceives that any auto maker not whole hog into AI self-driving cars is on its own death march. Their basic survival is depending upon AI self-driving cars. The pressures are enormous on the auto makers. As we’ve seen, some of the auto makers are trying to go after AI self-driving cars on their own, some are partnering with high-tech firms, some are buying up high-tech firms, some are working in an auto maker consortium, and so on. One way or another, they each are finding a means to get engaged in pursuing AI self-driving cars. They have to do so. Not solely because of the future possibilities, but also because of the perceptions of today about whether they are a progressive firm or stuck in the mud. Whether they are horse and carriage minded by solely doing conventional cars, or whether they are space age minded and embracing AI self-driving cars. Today’s market reacts to the signals sent by the auto makers as to where they sit on the spectrum of belief about AI self-driving cars. In recap, auto makers are forced into the AI self-driving car momentum by the nature of their core business, and by what their competition is doing, and by what the market expects them to be doing. High-tech firms such as Google and Apple have the “luxury” of choosing to aim toward AI self-driving cars because it gets them reputational advantages, it attracts top tech talent, it showcases they are leading edge tech makers, and demonstrates their boldness and innovation. Oh, and it could be that down the road, someday, AI self-driving cars become prevalent and those high-tech firms might miss out since they weren’t there from day one — that’s kind of an aside, though, and not considered a make-or-break as it is with the auto makers. At the Cybernetic AI Self-Driving Car Institute, we are developing AI software for self-driving cars. Our motivation is similar to the high-tech firms in that we like the challenge of it, it has great benefits to society, it could save lives, it has tremendous potential for new tech spin-offs, and it could be a monetary bonanza, based on the predictions that the self-driving car market will be around $20 billion by 2024, $800 billion by 2035, and perhaps $7 trillion by 2050. It’s a big money opportunity, for sure. Beyond the auto makers and the tech firms, there’s someone else that also cares about the emergence of AI self-driving cars. Someone that can see the future as either being a boon for them due to the advent of AI self-driving cars or that could be the destruction of their business. I’m talking about the ridesharing firms. Why would ridesharing companies care about whether or not AI self-driving cars are going to arrive? Let’s take a look at the business model of ridesharing companies. They are essentially a dating service. There are those that are looking for a date and those that are wanting to be a date. You want to get a ride from the office over to the baseball field (you are seeking a date, one might say). You go into a mobile app and state your request. A human driver of a car sees your request and accepts it (these human drivers are looking for a date, one might say). The human driver comes to you, you get into the car, the human driver drives you to the baseball field. Assume for the moment that the human driver was not employed per se by the ridesharing service and merely was “connected” to you via the ridesharing service (the middle man, so to speak), and happened to be a human driver registered with the ridesharing service (acting in an independent contractor role). The ridesharing service takes a fee for having arranged for the date. In order for the ridesharing service to be successful, it has to attract those seeking a date, i.e., those needing a ride. Success of attraction will predominantly be based on whether or not the ridesharing service can on a timely basis provide a suitable date, as in providing a human driver in a car that can as quickly as possible reach you and then suitably drive you to your destination. Do you care that much about the ridesharing service provider per se? Not really. Many people have both Uber and Lyft apps on their smartphones, and they shop as to which one can provide the suitable ride to them. We can quibble about the pricing as to whether there is a difference, and we can quibble about whether the drivers or their cars are better or worse, but by-and-large most would generally agree that there isn’t any significant difference between picking one of the other. How will AI self-driving cars impact these ridesharing services? Remove the human driver from the equation. Instead, imagine that there are self-driving cars. Furthermore, these self-driving cars can be owned by just about anybody. You personally decide to buy an AI self-driving car, and while at work during the day, you are willing to have your AI self-driving car driving around for ridesharing purposes. You do this to make some extra bucks off of your AI self-driving car. Today’s ridesharing services need to attract human drivers with cars so as to provide a ready service to the ride seekers. With the advent of AI self-driving cars, ridesharing services will need to attract AI self-driving cars to be a ready service for ride seekers. Where will the ridesharing services find these AI self-driving cars? One approach would be for the ridesharing service to purchase AI self-driving cars and use them as a fleet. This could work, but it is big change for the ridesharing services since they would need to own these assets and presumably take care of them, including the maintenance and upkeep of the AI self-driving cars. That’s not what they do today. They don’t own any of the cars. They are a match making service. Also, even if they decided to get into the car ownership for AI self-driving cars, it would be hard to predict how many such AI self-driving cars to have. Could they have so many that they could sufficiently meet demand? And, it would also be quite hard to predict where best to position geographically the AI self-driving cars for use. No, I don’t think we’ll likely see the ridesharing services opt to buy AI self-driving cars in huge bulk quantities and try to deploy them. So, what else can they do? They can appeal to the owners of the AI self-driving cars. Make money off your AI self-driving car by listing it with the XYZ ridesharing service. The ridesharing services make the same kind of plea today to human drivers. But, there’s a big difference in the future because they are now making the plea to the owners of the AI self-driving cars. The owner isn’t a driver. The AI is the driver. Why should these owners of AI self-driving cars decide that they will list their vehicle with the XYZ ridesharing service? Maybe they would list their AI self-driving car with many ridesharing services, figuring it increases the odds of their AI self-driving car being kept in-use. Ridesharing services would likely fiercely compete with each other to try to prevent this, offering deals for exclusivity, and seek to have the owner dedicate their AI self-driving car to just one ridesharing service, but doing so will be tricky to achieve (and some say darned near impossible). It gets worse though for the ridesharing services. Since this is really a match making service, the larger the pool of potential dates, the better it tends to be for those seeking a date and those offering to be a date. In that case, presumably any large-scale social media venue could do the same thing. Estimates are that Uber for example has around 75 million users of its app, and Uber has perhaps 3 million or so registered drivers. Those seem like big numbers. But, let’s consider the size of Facebook, which has around 2.2 billion users. That dwarfs the Uber numbers. If those Facebook users opted to list their AI self-driving cars for use, imagine the reach it would provide. All that Facebook would need to do is provide a software feature enabling the “dating” aspects, which isn’t that hard to do. And, there’s a another twist to the ridesharing future too. Suppose that blockchain becomes popular and as such we might not have any “middle man” per se involved in ridesharing services aspects. Instead, on a purely P2P basis, we would jointly use a specialized blockchain floating on the Internet to which we could make our own matches for ridesharing purposes. I would post my AI self-driving car as to its availability along with millions of others that own AI self-driving cars. Ride seekers would merely inspect the blockchain to find a suitable ride. Prices and other details might perhaps be auto-negotiated or already stated via the blockchain. Etc. This though has some holes to it in terms of the reality of making it work, and so let’s mark this as somewhat speculative for now. Uber and Lyft have mainly today as their secret sauce that they are able to connect you with a human driver that has a car and that is within ready reach of you and will take you to your destination. In the future, this secret sauce will be diminished by the prevalence of AI self-driving cars that any owner might wish to provide as a ridesharing capability. Today’s ridesharing services realize they are in a race against time. The sooner that AI self-driving cars emerge, the sooner they begin to lose out of their existing core business. The sooner too it becomes possible for other social media to overtake their business. You might say that the ridesharing services should somehow try to impede the emergence of AI self-driving cars, trying desperately to stave off what seems like a sour future for them. But, it makes no sense to suggest that ridesharing services could somehow prevent or inhibit the progress toward AI self-driving cars. How would they do this? Maybe try to push regulators to enact tougher laws on AI self-driving cars and thus curtail the public road trials? Insist that human drivers are much safer than true AI self-driving cars? Or take some other such means. As another famous line suggests, if you can’t beat them, join them. That’s what some of the ridesharing services have decided. Maybe they ought to get into the game and be a maker of AI self-driving cars. This seems somewhat logical not only because of the fact they are already in the business of cars, somewhat, but also because they are really a high-tech firm more than anything else. When you consider it for a moment, you realize that an Uber or Lyft is mainly a mobile app developer along with the back-end systems to support it. They developed a system that allows for what some call frictionless ridesharing. Are the ridesharing services AI firms? Generally, no. That’s why they have tended to buy their way into the AI space. Or, more specifically the AI self-driving car space. What does this gain a ridesharing firm? If they can be the first to achieve AI self-driving cars, it can provide several potential advantages. It can establish them as the way in which you should be booking your ridesharing and maybe that would increase their base of ride seekers. It could attract more ride seekers that are enamored of the allure of being driven in an AI self-driving car. It could allow them to possibly lock-down the underlying technology and the Intellectual Property (IP), perhaps preventing others from deploying AI self-driving cars, or maybe becoming a huge licensing and money maker for them to others that want to also provide AI self-driving cars. Etc. Now that I’ve laid the groundwork for examining the landscape of the major players consisting of auto makers, tech firms, and ridesharing firms as it relates to developing AI self-driving cars, let’s take a closer look at Uber as an example of the troubling times afoot regarding AI self-driving cars for a ridesharing firm. You likely know that Dara Khosrowshahi became the CEO of Uber about a year ago. The AI self-driving car unit of Uber has been steadily losing money, which generally is quite logical because it is primarily an R&D element. Putting company resources into R&D is always a hedge bet. You are betting that the money spent will ultimately achieve a return, but it could be quite a while before you can convert that R&D into something that can earn a return. It was reported in the New York Times that upon Dara’s first coming on-board that he had doubts about whether to continue to pour money into the AI self-driving car side of things (which is estimated losing them perhaps $100-$200 million per quarter). Apparently, once he had a chance to see it in action, he was swayed toward keeping it going. But, after the Uber incident in Arizona that led to the killing of a pedestrian, allegedly he swayed back over to being less committed to the venture. This seesawing of desire to keep the unit “as is” versus considering some other alternatives makes business sense when you consider the ramifications of the unit and the conundrum involved. Let’s first consider the downsides. It is unlikely that the unit will be a money maker any time soon. Furthermore, it holds the peril of tarnishing the overall Uber brand due to any additional complications or incidents that might arise when doing the public trials of their AI self-driving cars. Deaths and injuries make the news, especially as it relates to AI self-driving cars. Potential public backlash to such incidents and the prospects of heavy regulatory oversight looms as a huge hammer that could harm the company in a multitude of ways. Uber is also trying to get itself primed for an IPO. Firms usually tidy up and want to look as pretty as they can be to then make a big splash when going public. Having the AI self-driving car unit would maybe add brownie points to market perceptions, since it suggests a path to the future and showcases Uber’s innovation and boldness. But, if the unit suffers any ill-timed hiccups leading up to the IPO, imagine the devastating impact it could have on the IPO. If by bad luck they had an AI self-driving car crash and injury/death just days before the IPO, they’d be in a rather sticky situation of whether to proceed or not (and, if they did proceed, it could undermine the opening price and perceived value of the firm). Some might say that the tail has the potential to wag the dog. Right now, the presumed market focus should be on their existing ridesharing service and not be distracted by the future possibilities involving AI self-driving cars. Some say that they should just close down their AI self-driving car ambitions. But, if they suddenly opted to shut down the AI self-driving car unit due to the concerns that some malady might happen leading up to the IPO, or due to its present money-draining aspects, it would be a shocker to the market and have equally undesirable reactions. The unit is already on the radar of the marketplace. There would also be questions raised about the investments made to-date and why there isn’t some means to presumably recoup it. And so on. Some suggest that they could try to sell it. This would potentially provide an influx of monies and help the firm from a financial posture going into the IPO. If they sold it outright, it might though lead to questions about what is their intended future for AI self-driving cars. It could leave a gap or unanswered question. In that sense, it could be that it might make sense to undertake a sale that was coupled with some arrangements for Uber to have an ongoing stake, or maybe Uber barters a licensing deal to use the AI self-driving cars once perfected, or similar kind of arrangements might be made. It is important to realize too that AI self-driving cars won’t magically overnight become prevalent. I’ve predicted many times that there will be an ongoing mixture of conventional cars and AI self-driving cars for years to come. In the United States alone, there are 200+ million conventional cars, and they aren’t going to suddenly disappear and nor will they immediately be converted over to AI self-driving cars (if such a conversion or “kit” approach is even viable). Thus, in theory, ridesharing services will continue with their present model for quite some time to come, meaning that they will still be seeking human drivers of conventional cars, and then later on human drivers of AI self-driving cars that are not true AI self-driving cars. Gradually, the ridesharing services would include true AI self-driving cars. The mix of proportions of their ridesharing offerings would consist primarily now of the human driven approaches and only a minor amount of true AI self-driving cars, and the mix would over time slowly shift in the other direction. For ridesharing services, it is the best of times, it is the worst of times. Ridesharing has shifted from being a novelty to becoming a new cornerstone of travel. Currently, ridesharing is riding the wave. 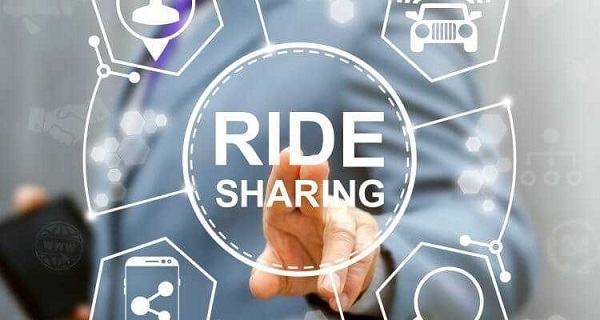 Making money off of ridesharing is still a challenge and it is a bit of optimistic faith to believe that it will be a tremendous money maker as the future unfolds. Up ahead looms the advent of AI self-driving cars. Ridesharing firms can’t ignore what’s coming down the pike. The question arises as to what is their best strategy right now regarding AI self-driving cars, and the degree to which they must either be invested in AI self-driving cars directly versus being merely affiliated with AI self-driving cars. Stay tuned.